Does your or﻿ganiz﻿a﻿tion n﻿eed to r﻿aise mone﻿y? 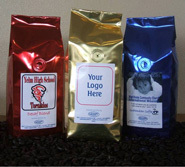 Fundraising with Olympic Crest delivers high profit margins, while selling premium fresh-roasted coffee. Below are comments from people who have utilized our fundraiser. We greatly appreciate your reviews and feedback. They help us improve our customer service and help others learn more about the quality of service we provide. Find Out More and Get a Sample! utilizing for your next fundraiser. fundraiser. Relay teams are using our Relay Roast to raise money to help fight cancer. Click here to see order form examples. Click here to view bag color options.